Somehow even though you do a full face of makeup in the morning, it does not look quite the same in the evening. The toll of the day’s activities and general life kinda smudge it around and wipe it off. But what happens if you have a date night or cocktails with the office after a long day at work? You definitely don’t have to do another full face of makeup. 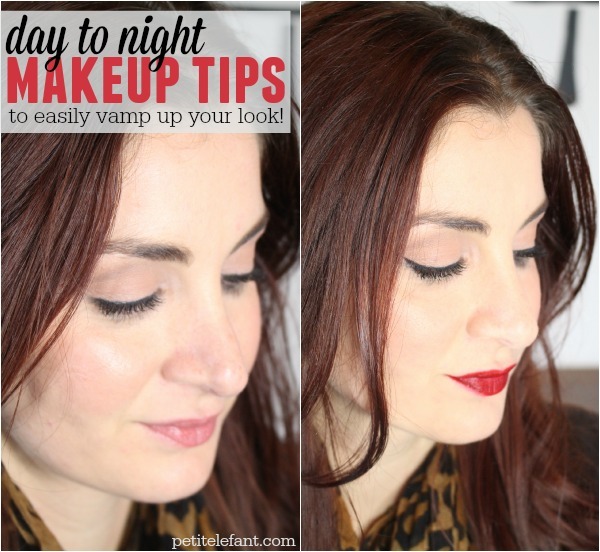 Use these simple tips to touch up your makeup for a night out. First of all, let’s talk about what you’ll need. It’s very simple, and I’ll tell you the brands I’m using, but use whatever you’ve got on hands or the products you already love! If you are looking to try a few new products, these are the ones I personally use and can recommend. Powder – I am using Younique powder and I really like it! 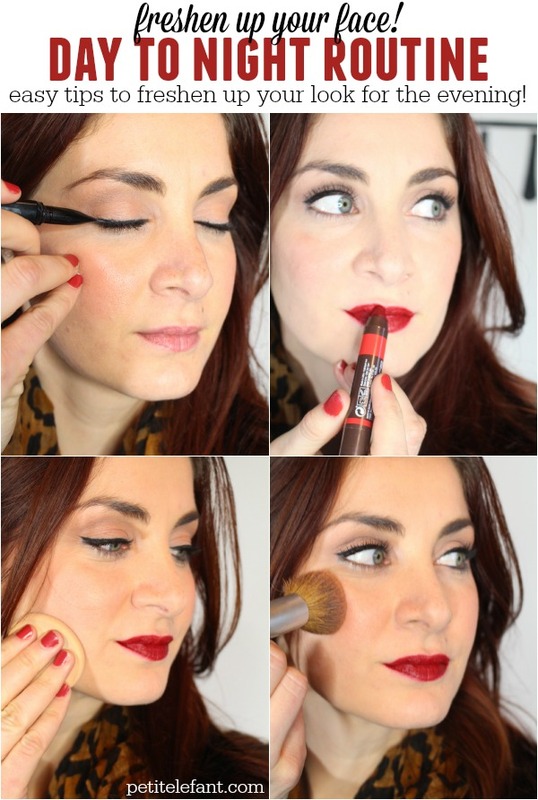 Red Lipstick – use your favorite shade, recently I’ve been loving these Burt’s Bees lip crayons. The color I used here is called Redwood Forest. They’re only $8.99 too! Black liner – I really recommend this liner, especially if you have trouble with the cat eye. It is angled and does all the work for you! Blush – I got this MAC blush in warm soul and I LOVE it! It’s the perfect shade of bronze yet blush. Mascara – I love my Voluminous, however if you’re looking for more oomph for your eyes I would suggest a fiber mascara like Younique. It’s like wearing false lashes without having to deal with false lashes. That’s it! Heck, you probably used half of these this morning. 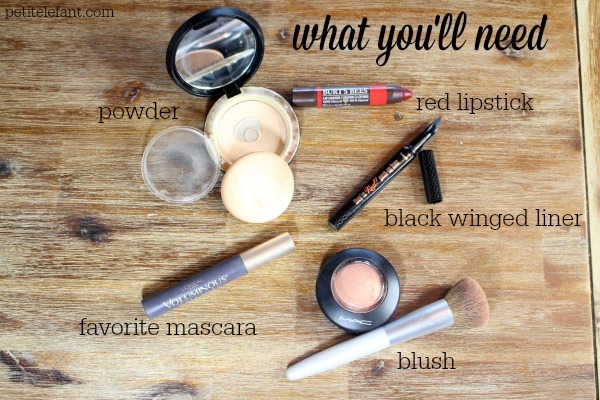 Now I’m going to show you how to freshen up your face with these basic products to go from day to night flawlessly! Let’s do this! Start with the liner. Adding a simple wing onto the end of your day eye liner can vamp up a look immediately! And trust me ladies, it’s not as hard as you think! Specially with an angled liner brush like the They’re Real liner. Then go ahead and add your favorite bold lipstick color. A bold lip and cat eye are the perfect pairing. I love a true, bright red, it always makes me feel a little fancier! But any bold lip would do. Go ahead and powder your face to touch up your foundation. No need to reapply, just touch of the areas that might have faded a bit throughout the day. Under the eyes, cheeks, forehead. It will help reduce shine too. After that add your favorite blush and you’re good to go! So what do you think? Is this a day to night makeup look you’d try? Or maybe it’s something you already use! Share with us your day to night makeup tips in the comments! << Would You Hit A Girl? Love the Burt’s Bees lip crayon in Redwood Forest. Ordered the Younique mascara today too! I’ve heard such great things about it, cannot wait to try!